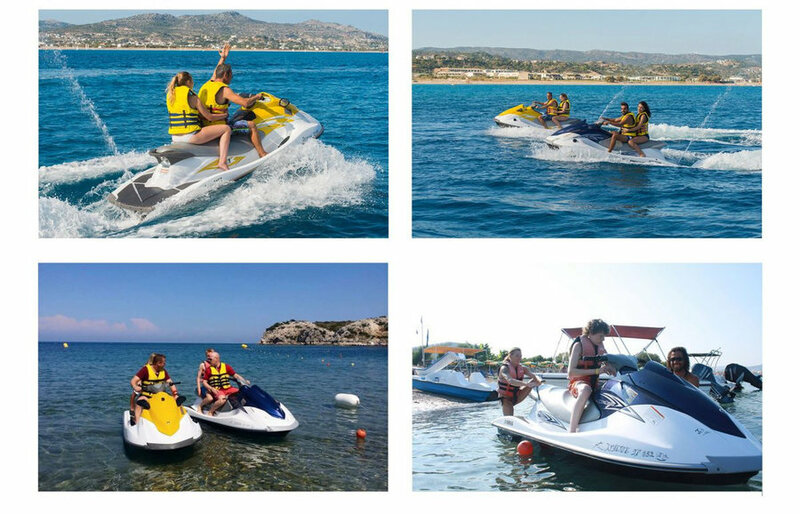 Jet Ski Rhodes at Kolymbia Waterports: Ride the Aegean like a Pro. It is Safe and Easy. Rent for one or two passengers, life jackets are provided. Get ready for a Jet Ski Rhodes adventure! Jet ski in Kolymbia Rhodes one of the most beautiful beaches on the island! Jet Skiing is a water sport in which an individual or dual riders use a Jet Ski to jump over waves at high speeds. Anyone who finds the water and speed thrilling will definitely enjoy this activity. How fast can my Jet ski go? Jet skis can reach top speeds of about 60 mph. However, you will only be allowed to go up to about 20-25mph since you will be running on an enclosed track. Is there any jet ski insructor? Yes, there will be general instruction provided and a guide will be available throughout your entire jet skiing experience. Life jackets are worn during this activity. However, for your comfort and ultimate safety, it is suggested that you know how to swim. All of our staff hold professional Internationally recognized qualifications and receive regular training and updates in Health and Safety practices and policies. Your safety means your enjoyment and each and every person receives the same level of care and attention to guarantee you enjoy and feel safe at all times. Our jet skis are top quality, equipped with a powerful Yamaha R1 Racing 1100 cc motor engine. Although lots of power, it’s 100% safe, even for not experienced drivers. Driving a jet ski is easier than driving a regular scooter, and all of our jet ski’s have remote control system ensuring that everything runs smoothly.